Himstates website is aspired to provide you competitive exams information, questions and answers ,formulas etc. 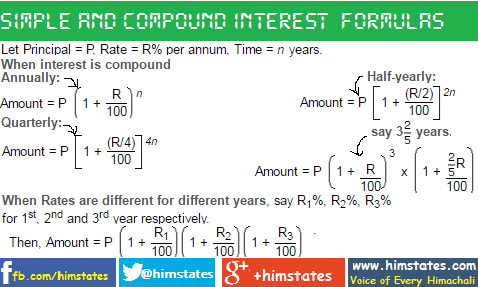 Simple and Compound Interests is an important topic for competitive exams, entrance exams as well interviews. Download full PDF of questions and answers on the topic of "Simple and Compound Interests". 'Simple and Compound Interests' important in which Competitive Exams ? Simple and Compound Interests aptitude questions are also important in state(Himachal Pradesh) competitive exams of HPPSC, HPSSSB, HPBoSE and many more exams of Banking as well as entrance exams etc. Principle Amount (P): The amount or sum is money that is lent out or borrowed. Interest : Extra Money on the amount of borrowed or lent out money. Simple Interest :Interest on a sum of borrowed or lent out money called as Simple interest. Simple Interest = (P x R x T/ 100 ). Q. 1. Simple Interest = 4016.25 Rate =9% yearly Time = 5 years. Find Principle amount ? Q. 4. Raghav took loan from Bandhan Bank @12% per annual of S.I. After three years he had to pay 5400 Rupees only for a period. What Principle amount Raghav borrowed from Bandhan Bank ? Q. 6. What will be the rate of interest if sum of Rupees 12,500 amounts to Rs. 15,500 in four years @ of S.I. Q. 8. What will be the ratio of S.I earned by certain amount at the same rate of interest for SIX years and that for NINE years? Q. 9. Amit took loan of Rupees 1200 with S.I for as many years as the rate of interest. If he paid 432 Rupees as interest at the end of the loan period, What was rate of interest ? Q. 11. At what rate of C.I per annum will a sum of Rupees 1200 become Rupees 1348.32 in two years? Q. 13. Find difference between the C.I on Rupees 5000 for one years @ 4 percent per annum compounded yearly and 1/2 yearly?